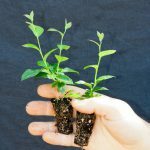 Grown in cells of 26 cc, our vegetal material originates from mother micro plants that produce a large quantity of homogeneous and vigorous micro cuttings. 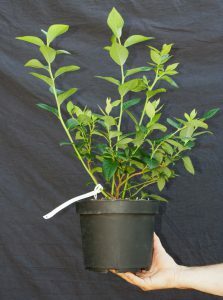 From a cutting re-potted in June, a 1 litre plant can easily be obtained in the same year (in Angers, France). 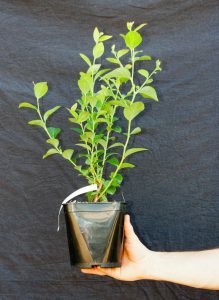 Destined for nursery gardeners, the P9 can be re-potted in containers of 2 or 3 litres. 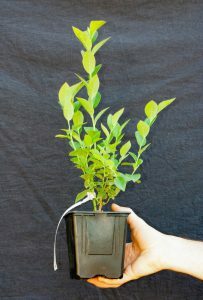 For mail-order nurseries, this ready-to-plant product offers an economic solution thanks to its small size and weight. 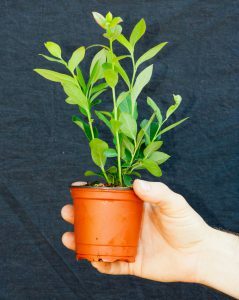 The 1 litre plant (11 x 11 x 12 cm) is a finished plant that can be resold directly, or re-potted in a larger container (>4 litres). Destined essentially for resale and for professionals not wishing to grow plants themselves because of the specific needs of Ericaceae. Ideal for fruit farmers wishing to produce a small-fruit range. Please contact us for custom developments. This is a finished plant destined for a premium clientele. Outside of custom orders, our stocks are generally quite limited.